J. Himbaugh steps in with a great, detailed review of the Tatooine wave (almost all of them) from Hasbro. Take it away, J! J. Himebaugh here. While I love Star Wars, and am certainly not a completist by any means, when I saw these figures on the shelf I knew I had to get the whole wave. Tonight, I’ll be reviewing the next two complete* waves of Star Wars 3 3/4" figures. First, we have the Tatooine wave, which consists of Momaw Nadon, R5-D4, Hem Dazon, Garindan, Han Solo, Luke Skywalker, and Sandtrooper. As well as the Bespin Confession Wave which consists of Darth Vader, and…Darth Vader, and… and…Oh Wait! That’s it. Just Vader. Who knows why Hasbro made a wave of one figure? 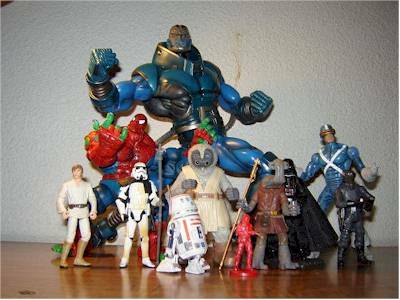 I know what you’re thinking, Why wont’ the other figures hang out with him? No, it’s not because he smells bad from not showering. (I checked ; D ). Maybe it’s the whole Badass Lord of Evil thing. Summer is a notoriously bad time for my local Wal-Mart to stock new toys (unless they’re tied into some horribly bad movie *cough* supermanreturns *cough*), so it’s always welcome when I see new guys sitting on the pegs. Luke, Momaw (Henceforward referred to as Hammerhead since that’s how everyone really knows him), and Garindan where only one each. There where four Arfive’s on the shelf so you should have your pick of the litter, three Vader’s, and two Sandtroopers (which are both NOW MINE *insert evil laugh*, so I wasn’t able to be particularly choosy except on a couple figures. This was a wave that I went into the store only wanting a handful of, but walked out of the store with a complete (almost) set. *Hem Dazon was already reviewed, and I wasn’t able to find Han Solo, though I heard he is not short packed and actually pretty easy to find. So I won’t be reviewing these two figures. These are the standard card backs and bubbles that you’re used to by now if you’ve been keeping up on the Saga Collection. I like them, they’re eye catching, and look nice. The large character photos on the insert help to quickly sort through the pegs, and the cardback scenes, help give each individual figure it’s own unique flair. I like the movie color-coding*, and character blurbs. Though, some are a little cheesy, and a bit forced. At least, with some of the major characters with multiple figures in this line we get scene specific blurbs and not some “Darth Vader was once a good man, Anakin Skywalker, and is now a dark lord of Evil out to destroy Luke Skywalker and the Rebellion, yada, yada, yada….” on all the different Vader’s, and Han’s, and Luke’s, etc. 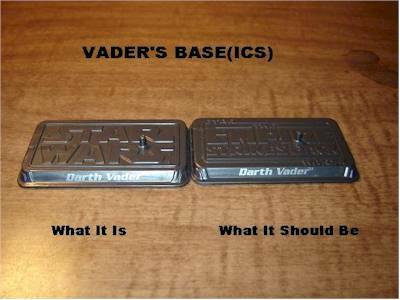 I actually heard one complaint that the Bespin Confession Vader had a spoiler since it says right there on the card back that Vader is Luke’s father. I found it amusing, and a silly complaint, since, come on! Who doesn’t know that Vader is Luke’s father? I also like the pictorial list of the other figures in the wave, (and a few before) so you get some idea of what the other figures look like just in case you are still looking for them. *Addendum: In my previous review of the Heroes & Villains Commander Bacara/Clone Shadow Pilot I’ d listed the movie color-coding scheme. I was not aware of this until just yesterday, when I FINALLY got my hands on a Foul Moudama that the Clone Wars has it’s own separate color, Tan. The Tatooitne wave is A New Hope blue. Let’s start with the clear winner, R5! 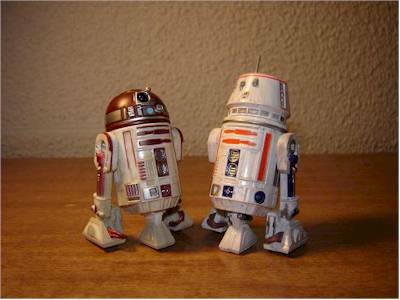 The body is that of the VOTC R2-D2 (though did you expect anything less) with an all-new head sculpt. He looks fantastic, so much so that even though he’s on of the more heavy-packed figures good luck finding him, as he’s been flying of the shelves. What does that say about a character with a modicum of screen time, whose biggest moment was when his head exploded? Speaking of great characters with minimal screen time and heads. Momaw Nadon, more affectionately known as “Hammerhead” also sports a great sculpt, with squinty eyes, wrinkles, bumps, long skinny fingers, frayed clothing, even his money purse on a rope belt. Did I mention that his sculpt is great, phenomenal, sensational, and also very good. On Garindan the sculpting is what sold me. I’m not a big fan of the character, and wasn’t to eager to squeeze more out of my already thin wallet, but once I saw him, I knew he had to be in the collection. That should be testimony enough as to how great a sculpt this is. We have more reuse from the VOTC collection. The Sandtrooper is the VOTC Stormtrooper body. Though this is exactly what we wanted. So, no complaints on the sculpt. Well, here’s one, the helmet looks off to me. I can’t place it, just off. Luke is supposedly a reuse from an older figure with a new had sculpt. I don’t have any other Tatooine Lukes so I wouldn’t know. The costume is very basic, and so is the sculpt, but with nice appropriate details in all the right places. The head sculpt doesn’t particularly look like Mark Hammil, but it does say naïve farm-boy quiet nicely and is a nice contrast to the original Saga Jedi Luke figure. This Vader we’ve now seen twice before. It’s the 500th figure Vader. This time around though his helmet is glued in place so it is no longer removable. While still not the quintessential Vader everyone’s been hoping for, he’s still a darn fine Dark Lord of the Sith. Now, I know what your thinking, how can I review a figure I don’t have? Well, simple I do have this figure, or rather one with an identical body. Since I know a little bit about this figure, I’ll just cover everything I do know right here. This is the same body we saw on Han Solo in the previous Saga Collection with a new head sculpt. The new sculpt is supposedly more cantina accurate, though I wouldn’t know. The body is fine, as well as the articulation. I can’t speak to the new head, or paint scheme, but It is a good generic Han Solo, devoid of any goofy action features. Besides Han wears like two different outfits in all three movies, so how many different figures do you really need? Unfortunately Jabba the Hutt put a price on poor Captain Solo’s head again, so he’s busy hiding and was unable to show up for picture day. Overall scale is very good in this wave. Luke is appropriately the shortest of the human characters. Vader is the tallest, followed by the Sandtrooper. 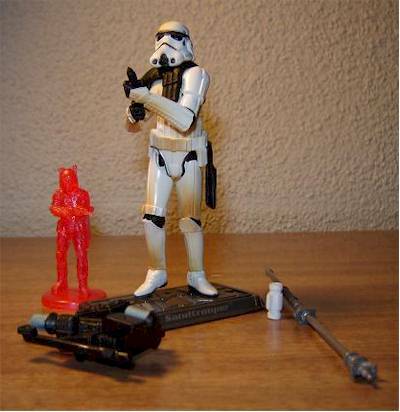 Hammerhead is almost as tall as the trooper, and Garindan is just a smidge taller than Luke. R5 is appropriately scaled the rest of the 3 3/4" figures. For mass-market stuff, Hasbro is doing a much better job in the paint department than in recent memory. R5 wins again, with almost no bleed or slop. All the colors are clean and consistent. What really makes this a four star paint apps is the weathering. He’s coated in a light wash that looks like he’s been sitting inside a humid, dirty sandcrawler. The wash is watery, and yet flows with the sculpt looking superbly used, and worn. Not fake as washes go. Again, in a very close second is our old buddy Hammerhead. Now, we all know that paint can make our break a figure, depending on how well it works with the sculpt among other things. No worries for ole Ham’head here. The blues, and tans on the folds and wrinkles of his skin and head, are extraphenomistastical (I know it’s not a real word). Other little details are addressed with little to no slop or bleed. What makes Garindan so great is the attention to little details. Namely, the paint was used to pull off a variety of different textures, and materials. The biggest nit to pick? His jumpsuit is all cast in solid gray plastic. No highlights, or anything. Now this is some real evidence where the Marvel Legends have really spoiled us, we expect washes, and whine when we don’t get them. 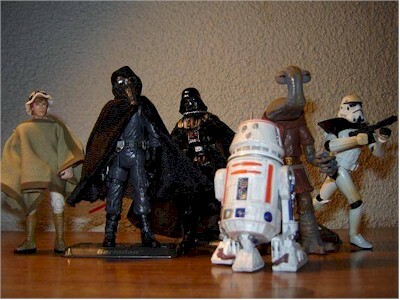 Speaking of washing, and figures who need to…You thought I was going to say the Sandtrooper. Nope, Vader! 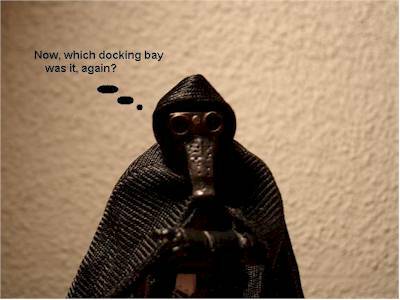 Okay, so I couldn’t resist another Vader-doesn’t-bathe-joke. So anyway, Vader has nice detailing in his little buttons and doodads, as well as silver “battle damage” on his right shoulder from a blow from Luke’s lightsaber. On a figure like Vader where there’s really not much to paint, it’s nice to see what does get painted done well. Luke has some really nice paintwork, and some areas that are really noticeable to hold back the score. Biggest issue, his neckline. The head is cast in flesh tone plastic, and his exposed chest is painted in a completely different color. Now if you look closely, in A New Hope, during the suns-set sequence you can see that Luke does have a noticeable tan line and his neck and chest are indeed two different shades. But, it’s not this extreme. His hair is also too dark, minor. But what really gets my bantha is the lips. Looks like Luke gets his fashion sense from his parents. How many Anakins is it now that have messed up an otherwise great figure, because it looks like he’s wearing lipstick (and it’s not even his shade to boot)? Also, I don’t know about you, but it took me forever to find a “Preggers Padme” whose makeup application did not make her look like a, shall we say, “Lady of the Evening”? Finally we get to the big loser of this bunch, the Sandtrooper. Man, these Imperial troops can seem to catch a break can they? His paint is nice no bleed, or slop to be found. Nice cutting between the black body suit, and white armor. Even a nice lightly sprayed on sand/dirt effect. So why such a low score? Because of the sand/dirt effect. Mainly, it’s only on the front, and looks great. Turn him around and it’s bright plastic white. Great for clean Stormtrooper armor, bur not dirty dessert troops. Even worse, his feet are bright white. Right next to the dirt smeared greaves it’s very noticeable, and distracting. What dirt effects are there are great, but it needs to be all over the figure. Now this wash isn’t quiet as horrible as the White Evolutions Sandtrooper who rather than looking like he’s been meandering around a desert, has been spending his time in the trash compactors or, rather, some “other” waste management system. Articulation is all over the place in this wave, and here’s where the reuse becomes evident. 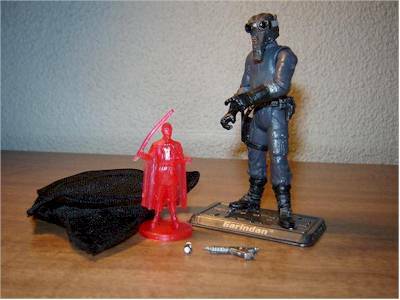 Vader and the Sandtrooper were at one time premium figures, and it shows. 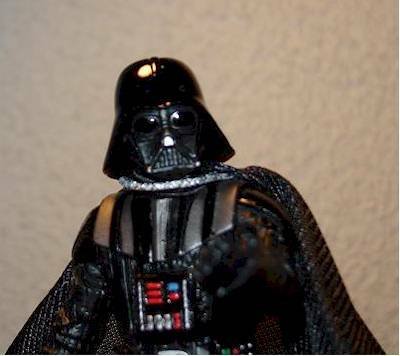 Vader has cut joints at the neck, shoulders, elbows, above the gloves, waist, and hips. He also sports unique ball jointed knees (evidence of his history as the Meditation Chamber Vader.) I’ve recently been collecting Vader figures to pilot the two upcoming starfighters (TIE Advanced x1, and Black Jedi Starfighter), my main criteria being the ability to take a seated position, though this particular Vader really impressed me. Do you like ball joints and pin/disk joints? Then this Trooper is for you. He sports a ball-jointed neck, elbows, and knees. The pin/disk joints that feature almost as much range of motion and interrupt the sculpt less appear on his shoulders, and ankles. He also features waist, torso, wrist articulation. The t-jointed hips are a bit disappointing, and are all that really hold the trooper back from perfect Four Star Articulation. R5 has cut joints at the head, shoulders, and feet. Six points of articulation doesn’t seem like much, but it’s all an Astromech Droid really needs. Luke shows his age with only cut joints at the neck, shoulders, elbows, waist, hips, and pin joint knees. Garindan features everyone’s favorite, the ball-jointed neck. Shoulders are pin/disk joints. Cut joints everywhere else, elbows, gloves, waist, hips, and boots. Hammerhead has the least mount of articulation. He has a ball-jointed neck, though due to the character design, it might as well be a cut-joint. Cut-joints at the shoulder, waist and hips. Fortunately, the articulation doesn’t interfere with the sculpt, which is incredible. Did I mention he has a great sculpt? Each figure comes with the now standard mini-hologram figure, and personalized display stand. This is the first wave to use the red holograms, rather than the blue ones you’ve gotten used to. Though some older figures, mostly the Army Builders (Snow troopers, AT-AT Drivers, etc…) are being re-released with red holograms. For merely the sheer number of accessories Luke is the standout here. He comes with his soft-goods poncho, a floppy hat, Obi-Wan’s chest, Anakin’s lightsaber hilt, and a pair of electrobinoculars. The floppy hat confuses me though. I don’t recall ever seeing Luke wear this at any point in the movie. 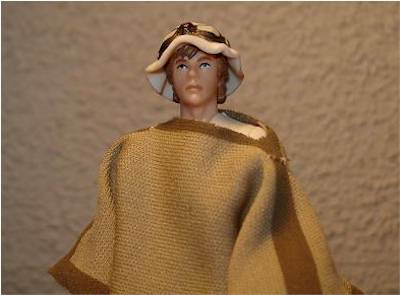 Though, he’s not the first Tatooine Luke to come with this accessory. It makes sense though in the arid desert climate, and the goggles (part of the hat sculpt) would be useful piloting the speeder. Anakin’s hilt fits into a slot in Obi-Wan’s chest. 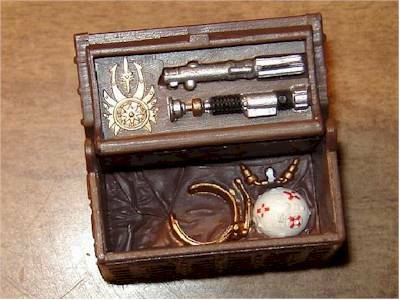 The chest is nicely sculpted and even has some non-removable Jedi gear, including training orb, and aqua breather. The electrobinoculars are my favorite accessory. I’ve wanted a pair for a long time now, as there are so many ways to use them, and so many different characters who could use them. This is one place where I wish they’d gone with reuse and given a pair of electrobinoculars to the Sandtroopers. The one thing that would have given Luke a Four Star Accessory score would have been a lit version of Anakin’s lightsaber. I am a huge fan of the new method of two lightsabers. I never liked the removable blades because they broke so easily. The newer figures (starting with the Episode III figures) giving them a solid sculpt lit, and unlit hilt that fit in the belt was a stroke of genius. I feel that this should be standard issue for all Jedi and Sith characters. Vader comes with his lightsaber, and several pieces of junk (literally). The lightsaber makes perfect sense and the junk is supposed to represent the debris Vader kept throwing at Luke during the Bespin duel. Every one of these crates is reuse of some kind, though I do know that at least one piece is from a set that was never produced. Don’t let their appearance fool you, both boxes are completely hollow, and they can stack inside one another. These bits and pieces are great though for fleshing out hangar scenes, whether or not they ever actually smack into a Luke Skywalker. 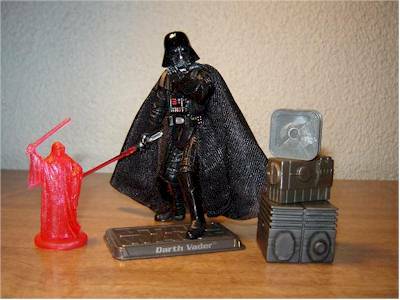 Vader also comes with a soft-goods cape, non removable due to the size of his helmet, and a soft goods skirt. It should be noted that Vader comes with the “wrong” display stand. This one only has the Star Wars logo, rather than The Empire Strikes Back like it should. If you pop off the head the pauldron is removable on the Sandtrooper, which explains why so many people are clamoring for a clean version of the Sandtrooper to make it easier to build Stormtrooper ranks. Hasbro again gets kudos for going the little extra mile on these Sandtrooper pauldrons. Why do I say this? Simple color. These Troopers sport the standard black pauldron of the Sandtrooper Enlisted Ranks. This will go well with the White Sergeant, and Orange Squad Commander that came out in the Evolutions packs. The last Saga Sandtrooper also sported the Gray pauldron of the Mounted Sandtrooper corps. 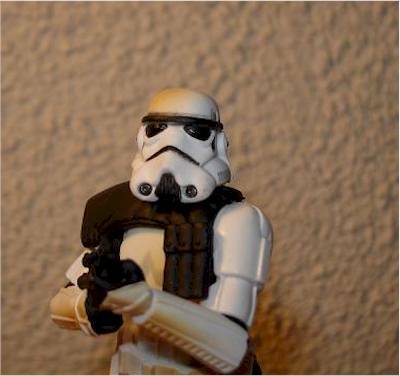 They also come with the standard Imperial Blaster which actually sort of fits into the holster at the trooper’s side. The Survival backpack, and canister (which I’m told is a thermal detonator) plug into holes on the Trooper’s backside, though not at the same time due to the backpack’s design. 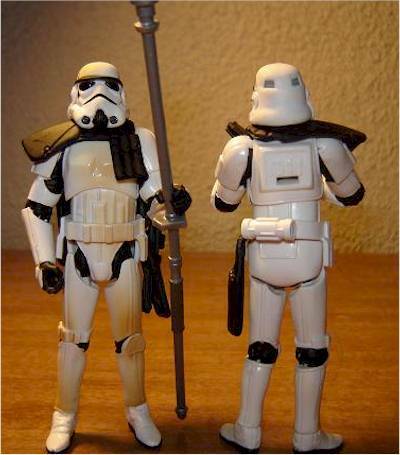 They also carry a lance-type pole arm that is useful in changing up the weaponry your Sandtroopers carry. The Evolutions versions came with heavy repeating blaster rifles. Hammerhead comes with an incredibly well sculpted staff cast all in one color, his hood, a Cantina Pillar Table, and bar glass. 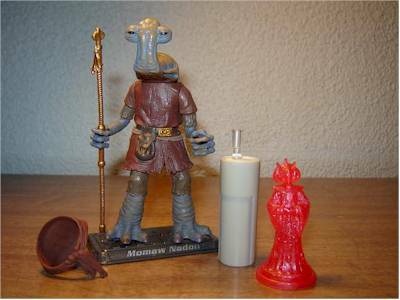 Sharp-eyed variation hunters will notice that Momaw Nadon, and Hem Dazon both come with one of three bar glasses. One with an opaque blue frothy concoction, a translucent version of this drink, or a clear bar glass. Mine came with the empty clear glass, guess ol’ Hammerhead got thirsty waiting for me to free him from his little plastic prison. 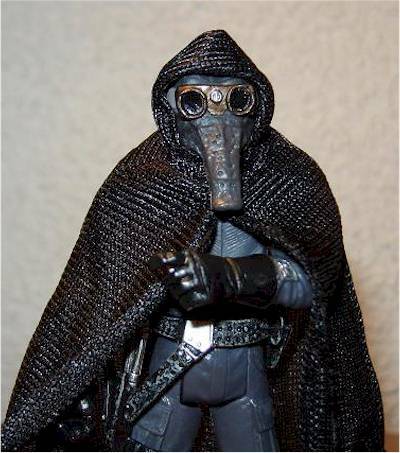 Garindan has a soft goods cloak that makes the old plastic version look sadly pathetic by comparison. It still doesn’t hang in quite the same manner as the on-screen version, though I suspect reuse in the cape. He comes with a nice blaster, that as far as I can tell is a unique sculpt. Nice effort, considering the character got less than a minute of albeit important screen time. Finally, he has a comlink that rivals Leia/Boushh’s Thermal Detonator as smallest Star Wars accessory EVER! Hasbro again gets bonus points for making the comlink an accessory, and not part of the sculpt. When it’s an accessory it opens up many more possibilities for posing and display, including hand that holds it. Both the blaster, and comlink can fit into pouches/holsters on his belt specially designed to hold them. R5 has not one, but two action features. I never thought I’d give any action feature a four star score, but these are great. Being both appropriate and unobtrusive to the rest of the figure. 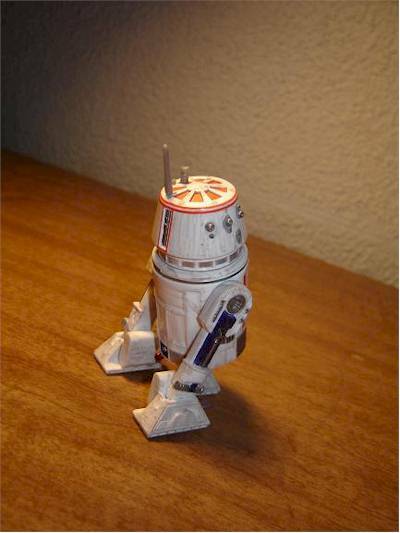 His head rotates and the “bad motivator” raises. He also has “Rolling Action” which is merely wheels on the bottom of his feet. It’s a great feature, and works great. All our Astro-droids should come with this feature. Unless you count standing around as an “action feature”, no one else has one. Which is JUUUST FINE! First and foremost these are toys, and intended to be played with. And as such, I’m treating them that way. Yes they sit on the shelf, but they do get played with. And these are a blast. Anyone who knows me knows I love Troopers. I feel that you can never have enough troopers, especially with all the different varieties. Troopers are fun. Kids especially love anything in white armor. Troopers are great, and these are good army builders. As it’s been stated, there’s just something neat about aliens getting hammered. *Get it! “Hammered”-“Hammerhead”* *I know, it was lame* Anyway, he looks great and any kid with some imagination should have a ball with Hammerhead, though. 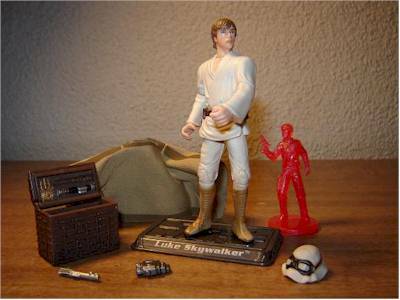 Luke is a perennial favorite, though the lack of a lightsaber to battle with may discourage some kids from this figure. Though, if you’re like me you definitely have a few extra sabers floating around. You’ll receive mixed reactions to R5. Though there are a lot of them around, they seem to be flying off the shelves. 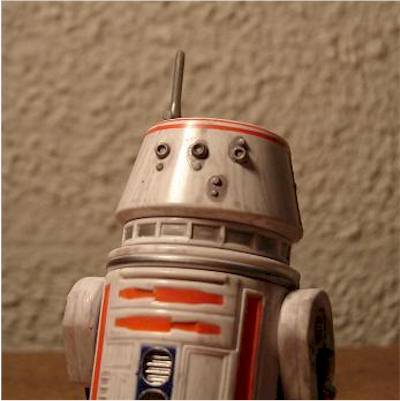 His value is probably directly related to the number of starfighters you own and your desire to not have R2-D2 be in every one. I love the little guy, and think he’s one of the best of the lot. Due to the esoteric nature of Garindan he’s not likely to see much play. His role is so utterly forgettable, that it’s doubtful many kids will even know who he is. And, he’s ugly, but not in that kid friendly neat sort of way. He may get some play from his cool blaster, but all indications are that sadly he’s the big peg-warmer of the line. These run $6 to $7 each. So you’ll end up paying around $56 for the whole set including Solo and Hem Dazon. That’s 56 bones for wave that discounting Luke, Vader and Solo get less than 10 minutes combined screen time. 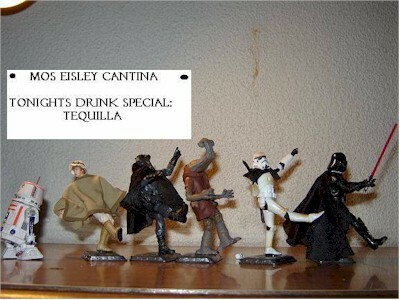 If you like Cantina aliens, and who doesn’t? Go ahead and pick up our two inebriates. You can pass up Luke, Vader, and Solo as well if you have versions that you are very happy with already, and want to save a little of your wallet. Though passing up Luke and all his goodies might be a mistake. 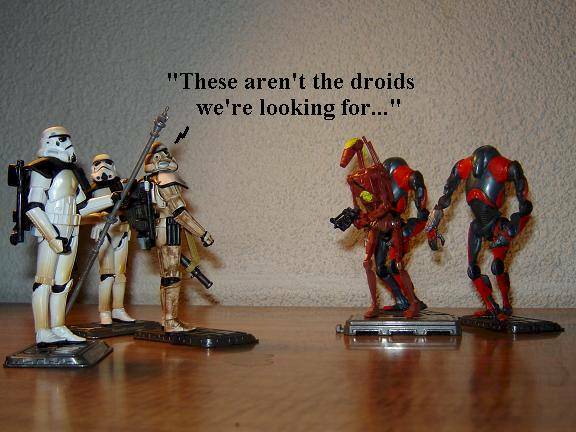 If you find them, the Sandtroopers are fantabulosical (I am also aware that this too is not a real word). If there’s one figure you can go ahead and pass up it’s Garindan, everyone else seems to be, so finding one if you do want one shouldn’t be too hard. 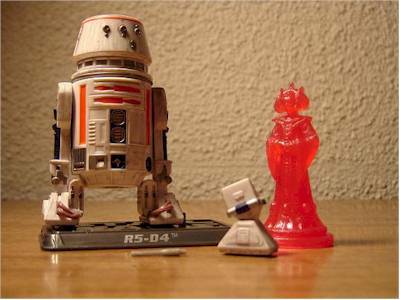 R5 is just one of the greatest little droids ever. I think that the mini-holograms don’t warrant the drastic price increase, but still, finding such great action figures with all sorts of neat little goodies below $7 in this day and age is almost unheard of. These are the first with the red holograms, though good news, if you hate the holograms just wait until 2007. Then Hasbro is changing both the packaging and the pack-ins. Starting next year they’ll be adding in…Collector Coins! *sarcastic “Yea”* I personally would like to see a new set of holograms. 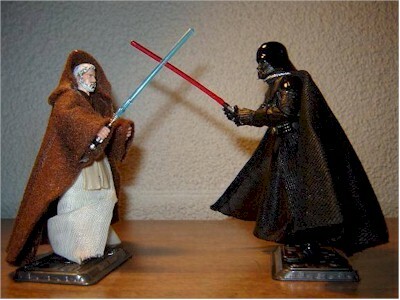 The scale is perfect for a “Help me Obi-Wan Kenobi, you’re my only hope.” Leia hologram. Though rather than blue then red, I would rather they make blue and purple holograms to match the larger hologram figures we’ve got. If you can, look for the best paint apps. Some figures you don’t have much of a choice on sometimes. Also, you might want to try and find a specific hologram figure. Look out for those different bar glasses, if you’re into that sort of thing. 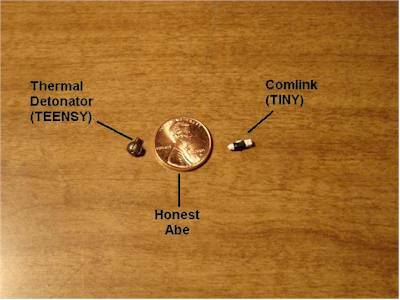 If you’re going to give Garindan to smaller children I’d suggest a preemptive strike and just take the comlink away. Or, if you really want, glue it in its holster or his hand. I’m just worried about the swallowing/loosing factor with such a tiny accessory. Also keep an eye on Vader and try to find one with the helmet glued on straight. One thing to watch out for with the entire collection is improperly packaged hologram figures. 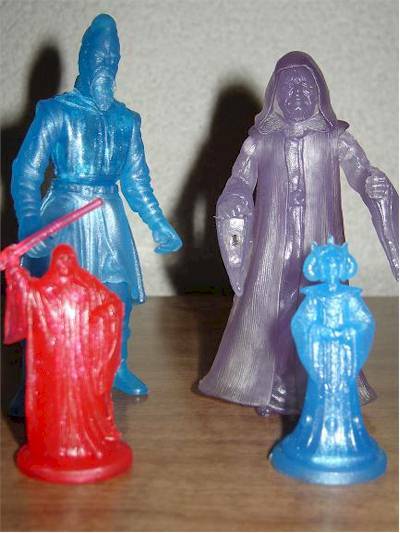 There have been numerous reports of Hero figures packaged with Villain holograms, and vice-versa. These mistakes, as you might expect, are worth more than their regular counterparts. If you don’t like the Star Wars 3 3/4" figures, I’m probably not going to change your mind. If you do, then this is one of the best waves we’ve gotten so far. 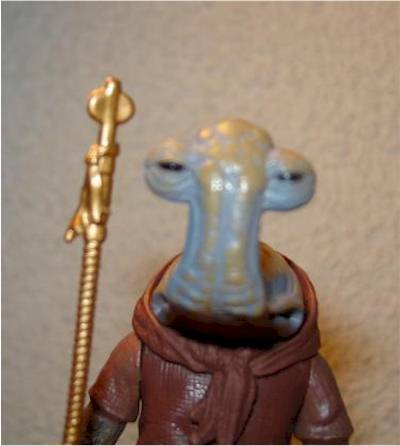 If you only get one figure from this wave I would recommend Momaw Nadon. And you thought I was going to say that feisty little R5. He’s great. Get him too. Luke is great for the superior sculpt and the myriad of accessories. I have been looking forward to a great Tatooine Luke for the Speeder/Droid/Interrogation Scene from A New Hope. I got tired of waiting for a decent Ben Kenobi so I made my own. Still holding out for a new landspeeder. 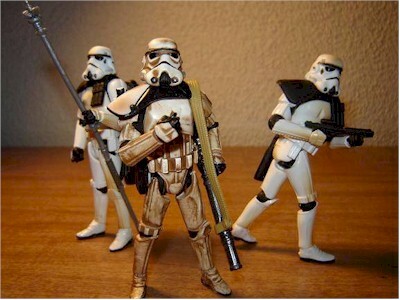 Speaking of simple-minded troopers, have I mentioned I love these Sandtroopers. Good Luck finding them since they don’t stay on the shelf long. Garindan’s esoteric origins and strange desing work against him. I love the sculpt and the accessories, but he’s not a necessary character. 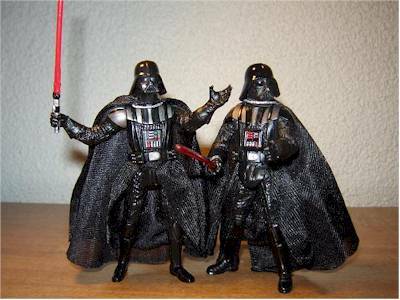 If your tired of Vader figures and reuse then go ahead and pass on the Bespin Confession Wave as well. These are hitting the brick-n-mortars pretty well right now, and seem to be your best and cheapest bet. I recently did a guest review of the Episode III Heroes & Villains Commander Bacara and Clone Pilot here on Michael’s wonderful site. There are also a number of other great Star Wars reviews as well. Figure from the collection of J. Himbaugh.